causes it to separate into its spectral colors. Last week we learned that the electromagnetic spectrum encompasses much more than the visible light represented by the colors of the rainbow. In fact, visible light is less than one percent of the entire spectrum which includes radio wave, microwaves, infrared, ultraviolet, X-rays and gamma rays. As the name indicates, electromagnetic waves are composed of both electric and magnetic fields which oscillate perpendicular to one another and to the direction of travel. In the vacuum of space, these waves travel at the speed of light until they interact with matter. 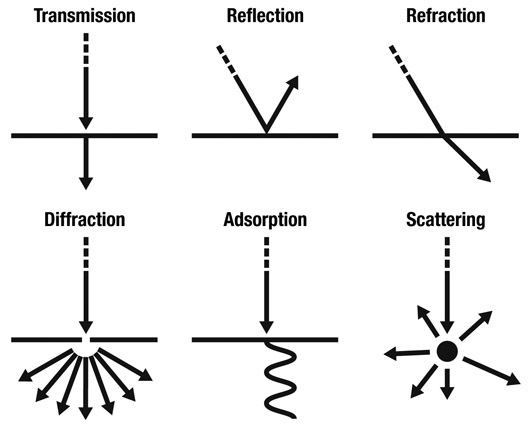 When light interacts with matter it can do one of several things, depending on its wavelength and what kind of matter it encounters: it can be transmitted, reflected, refracted, diffracted, adsorbed or scattered. The simplest interaction with light is transmission, which occurs when light passes through the object without interacting. Light coming through window is a simple example of transmission. Reflection occurs when the incoming light hits a very smooth surface like a mirror and bounces off, like a mirror. Refraction occurs when the incoming light travels through another medium, from air to glass for example. When this happens the light slows down and changes direction. This change in direction is dependent on the light’s wavelength so its spectrum of wavelengths are separated and spread out into a rainbow. 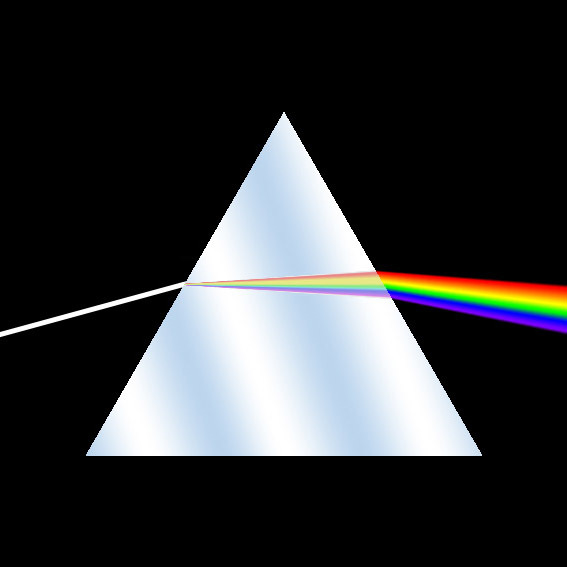 Diffraction occurs when light hits an object that is similar in size to its wavelength. When light passes through a sufficiently-thin slit it will diffract and spread. If it’s visible light, this will also create a rainbow. Absorption occurs when the incoming light hits an object and causes its atoms to vibrate, converting the energy into heat which is radiated. Anyone with a dark-colored car on a hot day will experience the effects of adsorption. Scattering occurs when the incoming light bounces off an object in many different directions. A good example of this is known as Rayleigh scattering, where sunlight is scattered by the gasses in our atmosphere. This is what gives the sky its blue color. I am from Brazil, and this post and figures helped me a lot when I was preparing a seminar about light and spectrophotometry. Thank you, and congratulations. Its a very nice site!